BEIJING - Liu Yang, the first Chinese woman entering the space, had an excellent performance in past eight days, a spokeswoman of China's manned space program said Sunday. The 33-year-old veteran pilot adapted to the weightlessness in space in a short time, said Wu Ping, spokeswoman for China's manned space program. "She is in good mental and physical state," said Wu, adding that all her physiological indices were normal. The spokeswoman said Liu had good teamwork with the other two male astronauts Jing Haipeng and Liu Wang, and obtained a lot of treasurable experimental data. Liu is in charge of medical experiments during the 13-day mission, which features China's first attempt at a manual space docking procedure. "We have made special arrangements for her life in space including personal hygiene and cleaning supplies. She will tell you whether she is satisfied with the arrangements when she comes back," said Wu. Joining the People's Liberation Army (PLA) Air Force in 1997, Liu became a veteran pilot after flying safely for 1,680 hours. She was promoted to deputy head of a PLA flight unit before being recruited as a prospective astronaut in May 2010. She is now an Air Force major. 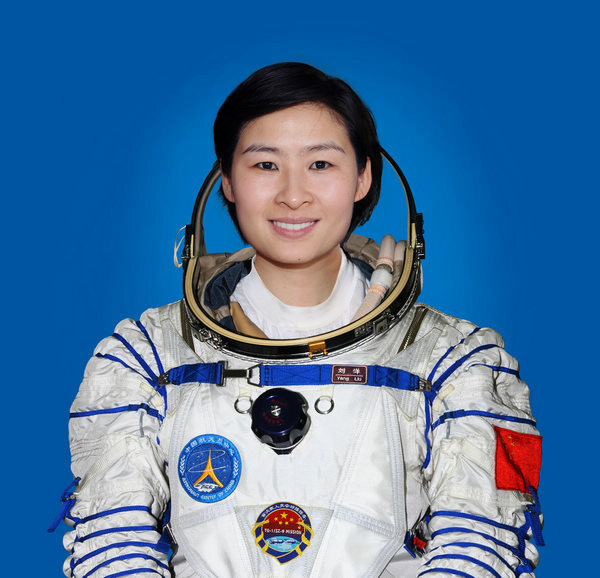 After two years of training, which shored up her astronautic skills and adaptability to space environment, Liu excelled in testing and was selected in March this year to crew Shenzhou IX. Since joining the military service, she has received accolades for her public speaking, winning the first place in a military speech contest in 2010. She also impressed others as a quick learner. After becoming an astronaut candidate in 2010, she devoted the first year to basic academic and physical training, only starting to study aerospace and astronautics one year ago. Before the start of the Shenzhou IX mission, she finished all scheduled training courses.